Malcolm Jefferson’s Cape Tribulation is set to return to action over hurdles in the £32,000 Grade Two John Smith’s Hurdle over three miles and a furlong at Wetherby on Saturday, November 3, 2012, day two of the bet365 Charlie Hall Meeting. The progressive eight-year-old completed a rare double in the spring when winning the Listed Pertemps Final at the Cheltenham Festival and the Grade Three Silver Cross Handicap Hurdle at Aintree’s John Smith’s Grand National Meeting. He finished 10th in the Grade One Grande Course de Haies d’Auteuil in June on very soft ground but returned from a break with a promising second on the Flat over two and a quarter miles at York on October 13, when he was beaten a head. Jefferson, who trains in North Yorkshire, said: “We are looking at the John Smith’s Hurdle for Cape Tribulation. He has come out his race at York in smashing form and I couldn’t be happier with him. “He was in good nick heading into York and I was hopeful he could win there but he just got beat. He ran a brilliant a race. “His progress in the spring didn’t surprise me. He has always been quite consistent and he started off last season running over fences but things just didn’t work out for him. It’s just one of those things, we put a few different jockeys on him and things like that but it just didn’t go his way. “He made a bad mistake under Paddy Brennan at Haydock (December, 2011) in very bad ground and that might have knocked his confidence a bit. He doesn’t want to be jumping fences on ground like that. “He ran well to be fourth over hurdles at Haydock in February so we thought we would stay over the smaller obstacles and it paid off. 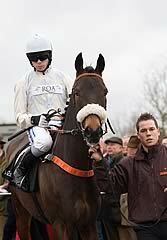 “We are going to give him an entry in the Hennessy Gold Cup as he is very well handicapped over fences. Unless something went wrong with Big Buck’s - we are not going to beat him - we will probably give him a try back over fences at some point. “I don’t think the trip in the Hennessy will be a problem for him as he stayed on well at Cheltenham and Aintree and he is a very tough horse. An exciting seven-race card at Wetherby on bet365 Charlie Hall Chase Day begins at 12.35pm and is headlined by the £100,000 Grade Two bet365 Charlie Hall Chase. Run over three miles and a furlong, the bet365 Charlie Hall Chase has been won by plenty of top-class staying chasers including Wayward Lad (1983 & 1985), Burrough Hill Lad (1984), Forgive ’n Forget (1986), Barton Bank (1993 & 1995), One Man (1996 & 1997), See More Business (1999 & 2000) and Our Vic (2006). The two-day bet365 Charlie Hall Meeting at the West Yorkshire course gets underway with a six-race card on Friday, November 2, headlined by the £23,500 Listed bet365 Handicap Chase over an extended two and a half miles and the £15,000 Listed Weatherbys Hamilton Insurance Wensleydale Juvenile Hurdle over an extended two miles. The first race is due off at 1.00pm.